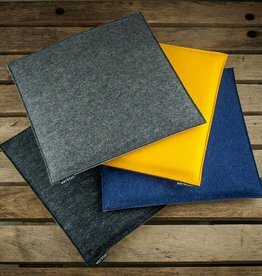 Felt cushions, seat pads and chair pads or bench pad, felt pads and felt mats made of wool felt, look good and feel wonderful. We manufacture individual felt seat cushions, pads and mats for your chairs and benches. In addition to our large selection in the shop, we also offer special designs on request. Felt seat pads ensure relaxed sitting and comfort at any time of the year. As simple as it is helpful - seat pads or mats made of wool felt in the dining room, living room and entrance area. Quickly laid out, they provide a fresh look in a wide variety of furnishing styles - from rustic to opulent to minimal. During short breaks as well as long evenings, felt seat pads ensure a pleasantly tempered and ventilated seat surface, so that more comfort and pleasant, soft sitting are guaranteed in summer as well as in winter. The additional pads also protect the underlying surfaces from wear and tear or dirt. The flat felt seat pads continue your style of interior design without moving too much into the foreground. 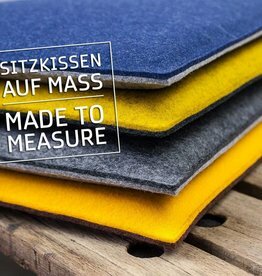 The plain felt seat pads in the beautiful 5 mm thickness emphasize your minimalist design but have little effect on your puristic overall effect. And thanks to the excellent insulation effect with the felt thickness of 5 mm, you have a warm and soft base. This is design in its natural form. The versatility of our colour scheme offers you plenty of scope for cosy interior design. Are you looking for a seat cushion? 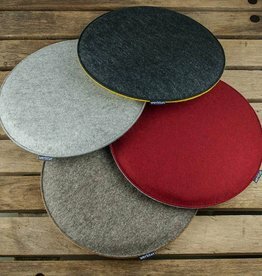 Here you will find our selection of felt seat cushions.